What are pro grade kettlebells? 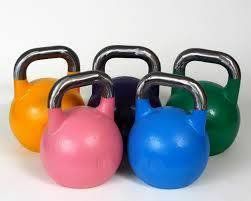 Pro Grade Kettlebells are the style of bells used in Kettlebell Sport (or GS, short for Girevoy Sport). The ergonomic design of the bell have been optimized to allow the athlete (a Girevik) to perform the maximum amount of repetitions in a competition. What are the advantages of Pro Grade kettlebells over cast iron kettlebells? All the bells are the same size regardless of weight, so you don't have to continuously adjust your lifting technique as you move up in weight. They are made out of ultra durable steel, which will not chip or break, and will last a lifetime. Colour coded so you always know which bell is which. The dimensions have been optimized for lifting.